Three years after launching a separate streaming app dedicated to gaming, YouTube has announced that its plans to retire the new software and integrate many of its core features into the main website. The company on Tuesday said that users will be able to see the specialized ‘Gaming’ section through a dedicated tab on the left sidebar under the ‘More from YouTube’ segment. The standalone YouTube Gaming app, the company said, will shut down for good in March, 2019. YouTube, however, says that the change is not the result of low demand for gaming-related videos on the platform. In fact, the company’s Global Head of Gaming, Ryan Wyatt, claimed that the amount of gaming-related content on the platform has grown exponentially over the past year. According to him, “50 billion hours of Gaming content watched on YouTube in the last 12 months and 200M daily logged-in users watch Gaming every single day on YouTube”. 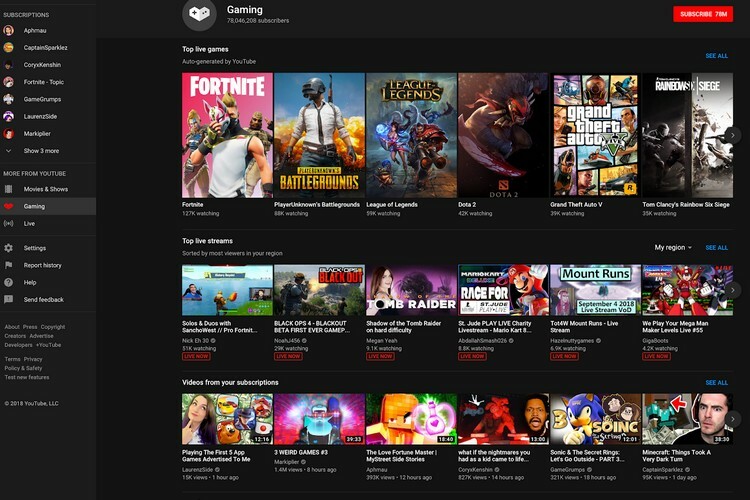 According to YouTube, the new landing page for gaming will have separate sections for games, showcasing popular videos, live streams, and other games created by the developer and publisher in question. Just like standard YouTube channels, users will be able to subscribe to these game-pages individually. “With tens of thousands of different game pages, you’ll be able to find content no matter how big or small the game is”, said the company. The Google-owned streaming giant further says that as part of its efforts to help smaller creators on the platform grow their viewership, YouTube Gaming will highlight gamers who are “On The Rise” and in Trending. The feature is launching first in the US, and will be rolled out to more countries in the future.